Yesterday and today I got up on the roof of the house and chopped ice away. I usually have to do this once per year because ice accumulates in the valleys of the house due a mistake we made when we put the addition on the house. 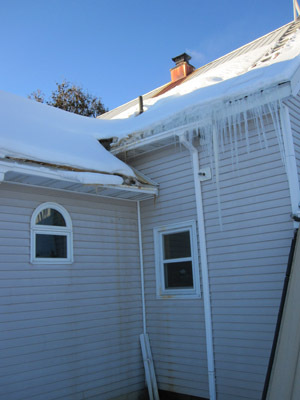 The ice piles up in the valleys because heat from the house below seeps out the cracks and into the attic. 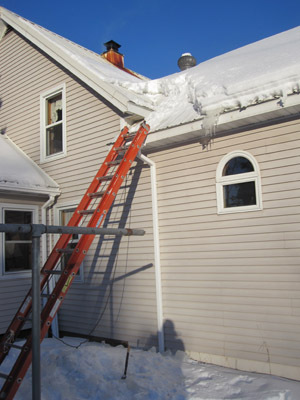 Once up there, it should be able to find the attic vents easily enough that is doesn’t hang around the roof long enough to melt snow, but in our case, the heat hangs around a lot, and the ice accumulates. It wouldn’t really hurt anything up there, except that water is constantly being made beneath the ice, and it moves around until it finds a way into the house. The picture shows the east side of the house that had yet to be done. This picture shows what the roof looks like when the ice has been chopped away. Now ice can start to accumulate in the valley again, but it will take months to build up to the point where it can cause a leak, and by then the weather will probably be warm enough that it will start to melt. Franco has wisely learned to stay away from the drop zone while I’m chopping. Sometimes some pretty big chunks can come sliding down, and they really hit the ground with a thunk. He seems to know that when I’m up on a ladder I’ll have to come back down the same way, so he lays down where he can see me and just waits. Good dog. This entry was posted on Thursday, February 3rd, 2011 at 10:25 pm and is filed under Uncategorized. You can follow any responses to this entry through the RSS 2.0 feed. You can leave a response, or trackback from your own site.